This is probably my favourite thing about the Autumn season. I love nothing more than snuggling up on the sofa, lighting some candles, watching a movie and having a cosy night in while the weather is horrible outside. I definitely prefer having more nights in than nights out at this time of year as who wants to walk around outside in a dress going from bar to bar?! That may make me sound like a total grandma but sometimes, nights in can be just as fun as going out - and, much less expensive! Now I'm a huge candle fan all year round but I don't tend to light them as much during the Spring/Summer months as the evenings are light and I don't feel they make my flat as cosy as they do in the Autumn/Winter months. However, now Autumn is here, the candles are out in full force and I'm enjoying lighting them every night at the moment. My current fave is Jo Malone Pomegranate Noir - it makes my flat smell amazing! I'm going to be gutted when it runs out though as it's a bit of a luxury and not something I can afford to burn all the time. Can you recommend any Autumn candles I need to try out? Yep, that's right - Starbucks pumpkin spiced lattes are back. I love grabbing myself one of these on a cold morning or for a long train journey. I also love the Autumn cups - they're so cute. I much prefer A/W fashion to S/S as I love layering knitwear, scarves and cosy winter coats. I also love wearing thick black tights with ankle or over the knee boots. I just find it's a lot easier to look stylish at this time of year for some reason. At the moment my favourite things to wear are roll neck jumpers, anything suede and little button front skirts with tights and boots. I also love finding my perfect A/W coat - I buy a new one every year. Snuggling up on the sofa underneath a cosy blanket is one of my favourite past times and Autumn is the perfect time of year to do it every single night. 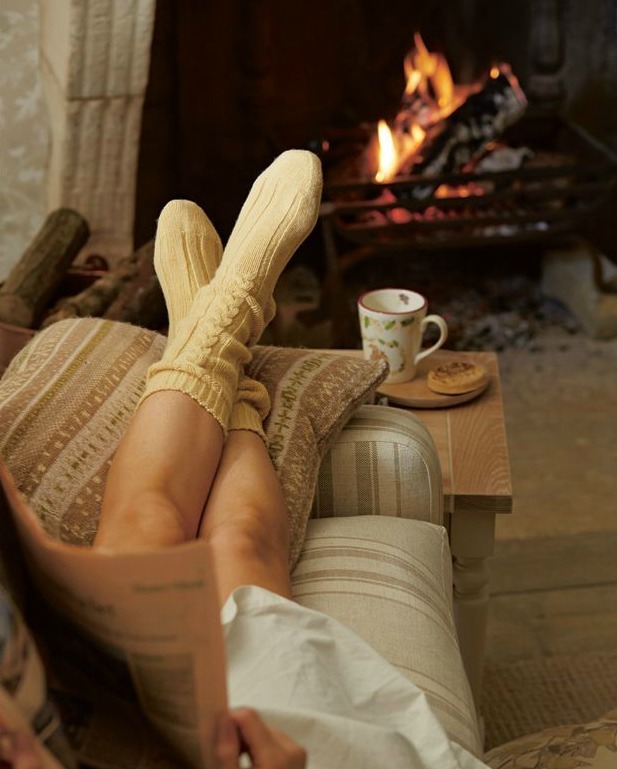 When it's cold outside, there's nothing better than feeling all warm and cosy inside. Add some fleece pyjamas, fluffy slippers and an oversized dressing gown and I'm set for the night. Don't you just love when it get to Autumn and fairly lights start popping up all over the place? I find they suddenly start to appear on the streets and in shop windows at this time of year and it always looks so magical. I usually like to have them somewhere in my flat too as there's something so relaxing about them twinkling away on a Autumn night. I'm sure you all know the drill by now - as soon as Autumn arrives, out come the berry/plum lipsticks and nail polishes. Mac 'Rebel' is probably my A/W favourite and I can't wait to start wearing it again. I also love dark nails - there's something really chic about them. The X Factor? Strictly Come Dancing? I'm a Celebrity Get Me Out Of Here? Check, check, check. I love when all of these TV shows are back on our screens as it means there's always something to watch in the evenings. I must admit I get way too involved in these reality style competitions and spend my evenings live tweeting my reactions but hey, it's good fun! I'm loving some of the talent on The X Factor this year too so I'm excited for the live shows to start! As if I couldn't include Christmas in this list. As soon as Autumn is here and the nights get darker, my first thought is 'Christmas is cominnggg' and I get super excited. Christmas is without a doubt my favourite time of the year and I love the whole build up to it - putting up the decorations, christmas market and christmas shopping are just a few things that will soon be here and I'm so so so excited! I'm such a big kid. I really love the A/W fashion too! I'm always cold so layering is a must for me. I'm really loving my scarves and over the knee boots this year! Autumn is perfect for me because I love to cosy up with some hot chocolate and watching some films. The TV is also the best at this time of the year too! I also love Autumn - it's my favorite season of the year!!! Love the smell of the air and the cozy nights and lying on the couch with blankets! I love Autumn as well and for all these reasons too! I am so excited for I'm A Celeb!! And of course Christmas too. I am massively in love with all of these things. Autumn candle scents are just the best and i've already have a gazillion Pumpkin Spice Lattes. Can't wait for the Starbuck Toffee Nut Lattes coming along soon too.. ! candles and that little bit closer to Christmas are my favourite things too! It really is the best time of year! This was such a refreshing and original take on autumn favourites, loved it!